416ce The sonic power and depth of Taylor’s Grand Symphony body shape, especially in the lower mids, add girth and sustain to the overall voice. 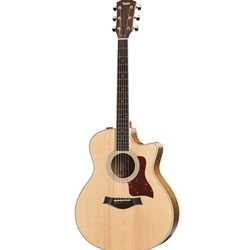 The cutaway ovangkol/spruce 416ce makes a bold strummer, yielding meaty midrange and strong treble notes, and its responsiveness to a light touch gives players a dynamic range to explore. Clean, modern appointments include crisp white binding, Italian acrylic dot fretboard inlays, and a three-ring rosette, with Taylor’s onboard Expression System® 2 acoustic electronics responding with a clear, natural amplified sound for performing or recording.